A good martial art could save your life. But maybe not quite how you might think. While martial arts might help you in a confrontation, the potential improvement to your health is the greatest benefit of your training. At the very least, martial arts will can improve your health and make you feel a great deal better. A study by the British Journal of Sports Medicine reported on the benefits of martial arts for the middle-aged population. They selected soo bahk do, a Korean martial art that is a lot like karate for their study but they also reviewed the effects of other martial arts. The study involved both men and women. Like any scientific study, this one was very thorough. 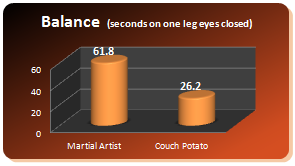 The comparison involved studying middle-aged martial artists and middle-aged sedentary people. It was clearly obvious that the martial arts practitioners had better aerobic capacity, balance, flexibility, muscle endurance, and strength. The only thing they had less of was body fat. Take a look at this graph of the results from the study. 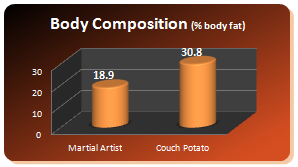 It’s quite clear that the martial artists were much better with regard to body composition. Martial arts in general are known to have great physiological benefits, including those mentioned above. As well these physical benefits, any form of martial art does wonders for your cardiorespiratory fitness. 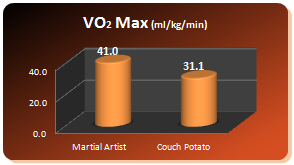 One of the better measurements of cardio-vascular fitness is the VO2-Max test. 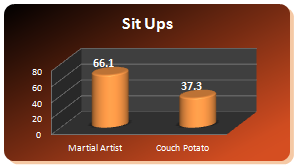 The results clearly show that the middle-aged martial artists are at a significant advantage over their sedentary peers. Interestingly, grip strength is considered a strong predictor of mortality and functional decline! 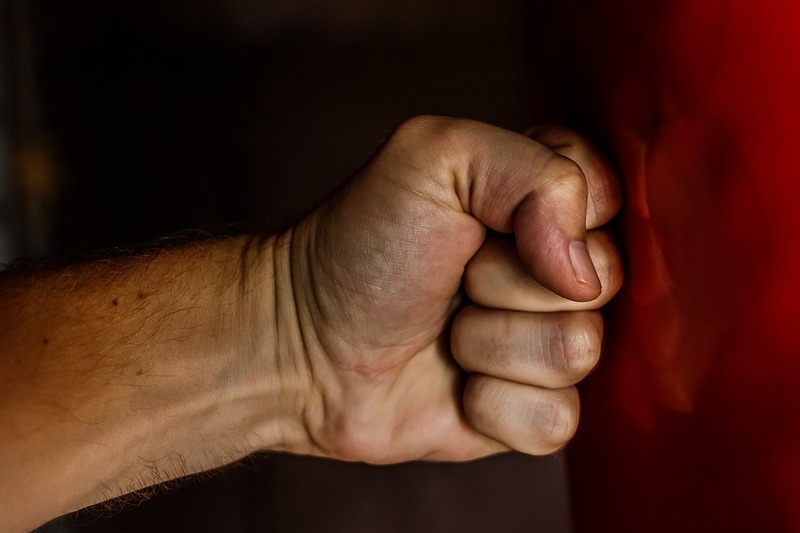 The more grip strength you have, the longer you will likely live. 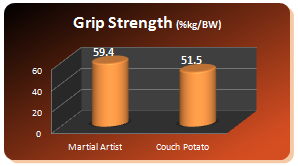 Although the result was not statistically significant, the graph clearly shows that for the groups in the study the martial artists had a much stronger grip. 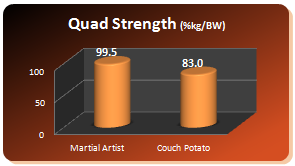 In another finding from this BJSM study, it was also shown that the martial artists had superior quadriceps strength, with a 20% better (statistically significant) result. Note that similar results have been found in other studies. In particular, amongst elderly practitioners of tai chi, this 20 percent is noticable after a mere 6 months. Tai chi is among the most popular martial arts along with karate, judo, soo bahk do, tae kwon do, and kung fu. Tai chi might look like a slow and easy exercise. However, studies of elderly tai chi practitioners have shown that they have excellent cardiorespiratory function, flexibility, balance, muscle strength, and muscle endurance and decreasing body mass. 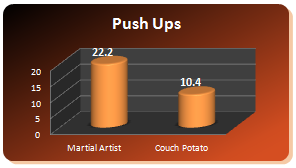 Other strength measurements looked at were push-ups and sit-ups. Although these are representative of upper-body and core-strength respectively, one does wonder whether there is some element of technique involved here. 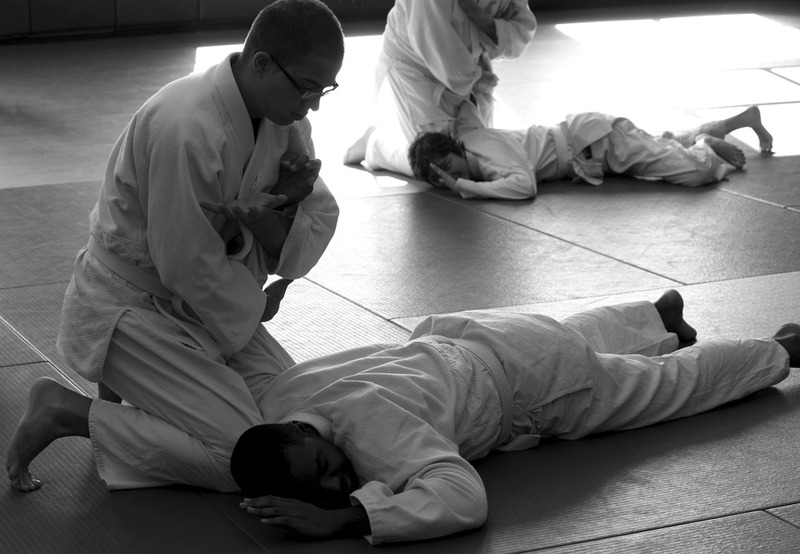 Many martial arts incorporate push-ups and sit-ups as a regular part of training. Flexibility and balance are chronic issues in aging. So much so that these are accepted as regular signs of aging. If you can reverse these two things, your middle age and old age will be much healthier and a lot more enjoyable. Martial arts can reverse and therefore slow the process of aging significantly. The British study showed that the difference in flexibility between the practitioners and the non-practitioners was 114 percent. Balance becomes extremely important as you age. Thousands of elderly people are injured in falls every year, and as you age the injuries that can result from falls become worse, and even life threatening. It is not uncommon to hear of an elderly person who has fallen and broken their hip. Martial arts are known for their ability to improve balance, and in some countries they are actively encouraged for older people. Tai Chi is very popular for this purpose. 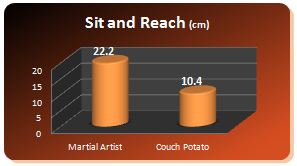 With regard to the BSMJ study, the balance of the group martial artists was more than twice as good as the sedentary group. One can only assume that the benefits of gaining this balance in middle-age will remain as you get older. The British Journal of Sports Medicine study specifically showed that the middle-aged adults who participated at least twice a week for at least three years were able to perform daily activities vigorously, with capacities showing that they were a very low risk of contracting hypokinetic diseases. Another way of expressing the concept of hyokinetic diseases is to call them couch potato diseases. These are obesity, high blood pressure, high cholesterol, osteoporosis, osteoarthritis, low back pain, and type 2 diabetes. A one-hour class twice a week can make a huge difference in your susceptibility to these diseases. 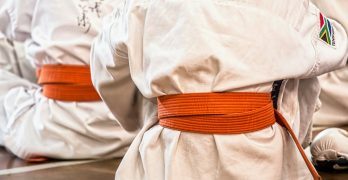 While not covered in the study, it is important to note that the benefits of martial arts go beyond the physical benefits. There are several outstanding psychological perks as well. Not only do you have more energy, you are more productive because exercise releases endorphins, which makes you feel happier and fuels your brain. Unlike running on a treadmill, martial arts are not boring. These are interactive sports that calls for discipline and focus. You have to be in the moment and your mind does not have the time to fret over your problems and feel the stress that often is a part of our daily lives. 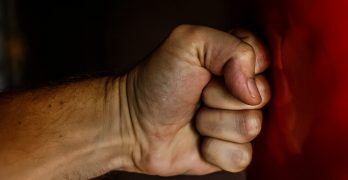 Speaking of stress, martial arts are ideal for combating stress. It involves more than your muscles. It involves your brain and your emotional core. Each move increases your focus and your self-confidence grows from your newly developed ability to focus and control your body. It has been proven that martial artists have better social savvy and less anxiety than the general population. Their bodies are resilient, resonating, and healthy. Their mind-body connection is superior. 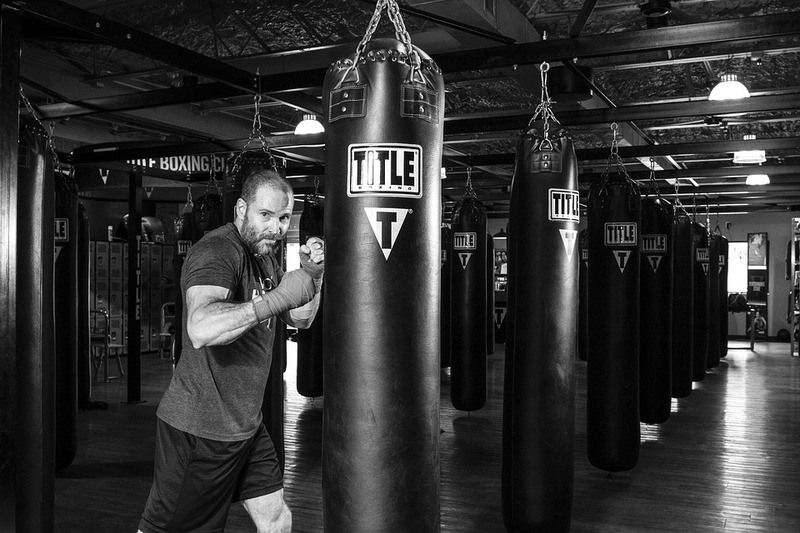 If you are middle-aged and you want a complete makeover of your entire being, martial arts can do it for you. There is a social aspect to it and you can join at any level. Even if you think you do not have the balance, a little practice will have you standing on one foot before you know it. That alone will give you a great sense of self-confidence. Once you take that first step, you enter into a whole new world. As well as improve fitness and health, you will also have many positive psychosocial side-effects. This a life changing decision that you will not regret. The benefits of martial arts are holistic.